Are you using your company blog to its fullest potential? Many brands use blogs to broaden their exposure, but few have truly mastered the art of using blog copy to make sales. According to passionate copywriting pundit, Chelsea Baldwin from Copy Power, whether you’re after B2C or B2B sales, the copy you put on your blog can become an effectual component of your sales funnel. The key, she explains, is a combination of establishing a genuine brand voice, embracing creativity, and working efficiently. You wouldn’t use B2C sales tactics in a traditional B2B sales pitch, so why would you use the same B2C language in your B2B copywriting? Successful copywriting begins with a thorough understanding of who your reader may be with the goal of addressing their specific needs or desires. 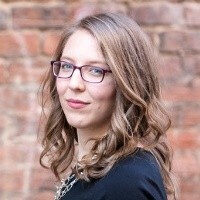 Through her years of experience helping companies upgrade their blog copywriting at her company Copy Power, Chelsea understands the difficulty of identifying and catering to a specific audience when that audience is a business rather than an individual. Writing B2C content for potential customers should begin with market research to identify and understand what types of people would be interested in your products and services. Once you’ve formed a mental archetype of your ideal reader, it’s fairly simple to put together a readable blog post. Chelsea explains that B2B copywriting can often seem a lot harder. Unlike writing to audiences of individual consumers, B2B copywriting aims to address “an idea, a concept, a passion” that business owners can resonate with. More than that, these ideas, concepts, and passions are dynamic and are subject to grow or change over time. Writing content aimed at businesses is no excuse for boring copywriting. Rather than focusing solely on radiating corporate professionalism, effective B2B copywriting always openly reflects the authentic personality of the writing brand. Brands develop voices gradually over time as it becomes clearer where they fit in the grand scheme of things. In B2B copywriting, your brand voice should consider the core identity of your business and how you want your brand to be perceived by consumers while also keeping the reader in mind. Chelsea explains how she uses her copywriting to share her personality with potential clients. While businesses with more structured and corporate company cultures may prefer a professional tone, there’s always room to inject your brand personality into your B2B copywriting. Writing beautifully won’t make sales unless your B2B copywriting also provides readers with valuable information. If you can demonstrate that you understand both the emotional and technical aspects of the readers’ problems or desires, then you are much more likely to make a sale with your B2B copywriting. All niche copywriting requires a couple hours of topic research. At Copy Power, Chelsea offers her clients a questionnaire through which they can share the underlying emotional goals behind what they do. Before writing, Chelsea likes to get a deeper look at why customers seek out businesses for their services and help. She explains how when it comes to making decisions “the emotions always come first”. Because humans use their emotions to guide decisions, it is important to examine the emotions of your potential customers before writing. Have you ever experienced writer’s block? It can be frustrating to sit with fingers itching to type but a blank mind. You can avoid writer’s block altogether by accessing your creativity in a brainstorm before beginning your post. “While you’re brainstorming, you’re not putting pressure on yourself to be sales-y,” Chelsea points out. Doing a brainstorm allows you to write out words, phrases, and general ideas without feeling any pressure for perfection. There’s no right or wrong way to brainstorm, but Chelsea suggests taking a “jargon phrase”, an almost cliche phrase used commonly in blogs, and trying to understand the emotional reaction it can cause. You can rework the phrase and idea to cause the same emotional stir in a new way that is unique to your brand. The brainstorm phase is key in capturing the reader’s emotional resonance. While it may seem scary to add an additional step to your blog writing process, the brainstorming phase may actually save you time in the end. Chelsea explains how she will often copy and paste ideas from her brainstorm into her B2B copywriting. Things that go unused often serve another role, such as website copy or copywriting for another post, later on. Aside from creating an emotional reading experience, B2B copywriting should also focus on details. The less generic your information is, the more likely the reader hasn’t already heard it and is interested in learning more. Chelsea suggests using concrete examples to emphasize points, such as including numerical statistics and or links to other related blog posts. Chelsea also warns that people have been desensitized to “jargon phrases”. B2B copywriting may be intended for businesses, but it should still aim to stand out. For those looking to make sales off of B2B blog content, Chelsea advises unabashed authenticity. She says you should do what you love because “if you do it from a place of service, the money will flow”. This philosophy is at the core of Chelsea’s B2C and B2B copywriting successes: if you are truly passionate about your brand, you can convince others to be as well, even through copywriting.